When the optics are too powerful for the length of the eyeball one is said to be myopic or nearsighted. This can arise from a cornea or crystalline lens with too much curvature (refractive myopia) or an eyeball that is too long (axial myopia). The result is vision that is clear close-up but blurred at a distance. Myopia can easily be corrected with a concave lens which causes the divergence of light rays before they reach the cornea. In one’s spectacle prescription there will be a minus sign (-) in the ‘sphere’ box. Spectacles may be required for many everyday activities such as driving or watching TV. When the optics are too weak for the length of the eyeball, one is said to be hyperopic or farsighted. This can arise from a cornea or crystalline lens with not enough curvature (refractive hyperopia) or an eyeball that is too short (axial hyperopia). The result is vision that is generally clearer for distance than at near. Hyperopia can be corrected with convex lenses which cause light rays to converge prior to hitting the cornea. In one’s spectacle prescription there will be a plus sign (+) in the ‘sphere’ box. Spectacles may be required for reading, VDU work, driving and watching TV. When the optical power of the eye is too powerful or too weak across one meridian, such as when the corneal curvature or that of the crystalline lens is oval in shape, then one is said to be astigmatic. A person with an astigmatic refractive error sees lines of a particular orientation less clearly than lines at right angles to them. 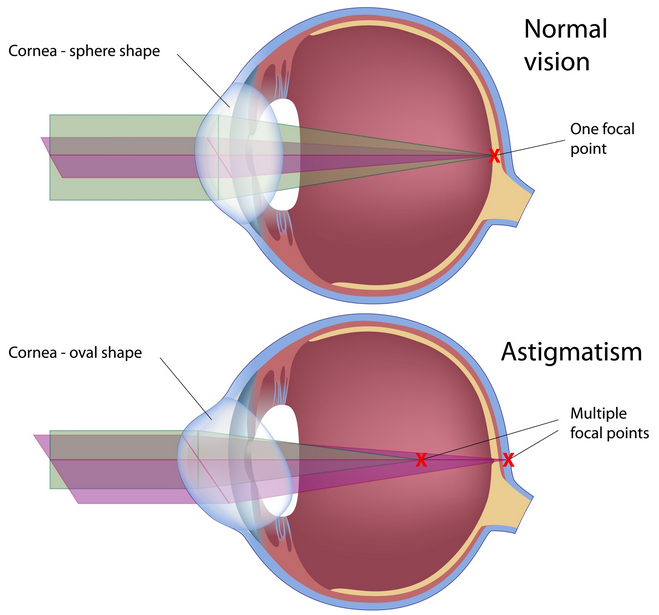 Astigmatism can be corrected by refracting light more in one meridian than the other. Cylindrical lenses serve this purpose. In one’s spectacle prescription there will be numbers in both the ‘cyl’ and ‘axis’ boxes. Your vision may be blurred at all distances and you may need to wear glasses all of the time. 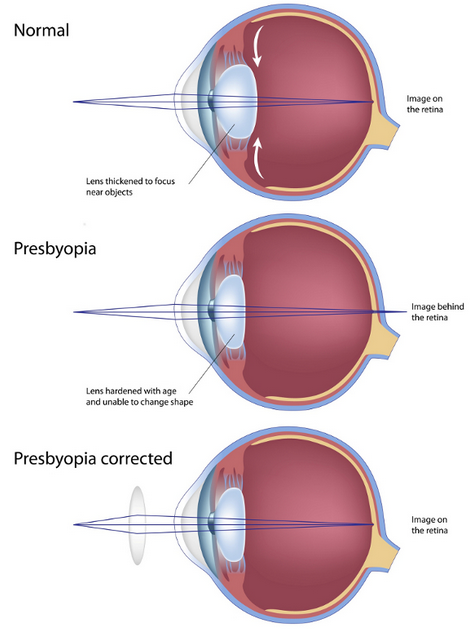 When the flexibility of the crystalline lens declines due to age one is said to be presbyopic. This results in difficulty focussing on near objects which is often relieved by reading glasses, bifocals, or progressive lenses. In one’s spectacle prescription there will be a number in the ‘near’ and/or ‘intermediate’ boxes. Everyone’s vision changes over time and you may experience one or more of the above conditions. That is why it is important to have regular eye examinations. If you have any questions about your eyesight or optical prescription please do not hesitate to contact us.